The Auld Lammas Fair has been held in Ballycastle since the 17th Century. It takes place on the last Monday and Tuesday of August and traditionally marks the end of the summer and beginning of the harvest. Its exact origin is uncertain, but one theory is that it began as a result of the occupation of the area around Ballycastle by the MacDonnell's of the Isles in the early part of the 16th century. Dulse or dillisk or dilsk (from Irish/Scottish Gaelic duileasc/duileasg) red dulse, sea lettuce flakes or creathnach, is a red alga (Rhodophyta) previously referred to as Rhodymenia palmata (Linnaeus) Greville. Its a perennial favourite for some which grows on the northern coasts of the Atlantic and Pacific oceans. It is a well-known snack food first harvested by Colmcille and his monks 1400 years ago. 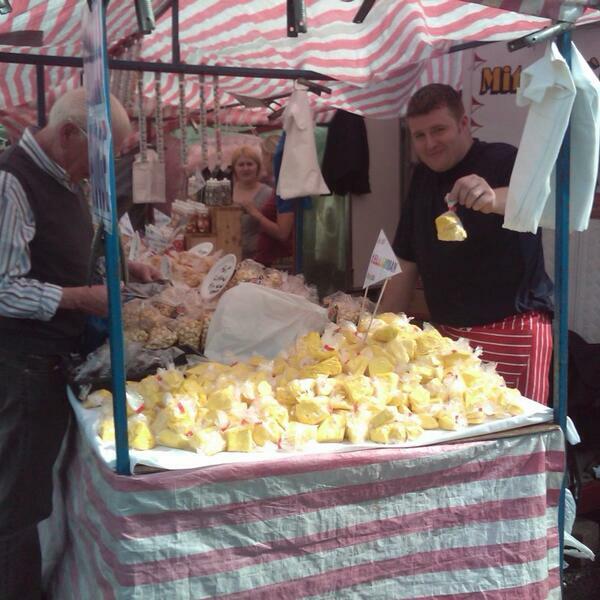 Yellowman is a chewy toffee-textured honeycomb sold in non-standard blocks and chips and is associated with the Auld Lammas Fair in Ballycastle, County Antrim, where it is sold along with other confectionery and often dulse. Yellowman, or Yellaman, is similar to Honeycomb toffee, except that the more solid 'rind' usually consists of at least half the quantity. The rind is hard, having a similar consistency to rock. Yellowman needs to be heated to high temperatures to get the golden syrup and sugar mixture to reach the ‘hard-crack’ (300 °C) – the temperature at which boiled sugar becomes brittle when cooled. It will also only acquire its unique bubbly and crunchy consistency when a reaction occurs between the vinegar and the baking soda, which vigorously adds carbon dioxide gas throughout the mixture. Ingredients of Yellowman are commonly quoted as including brown sugar, golden syrup, butter, vinegar and bicarbonate of soda but there are many local variations in ingredients and recipes. Your teeth have been warned!